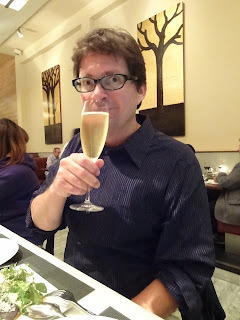 On Tuesday, I won the Roederer Award for Online Wine Columnist/Blogger of the Year. I wasn't able to attend the ceremony in London, so I'll give my speech here. will try to drink as much of as I can look forward to sharing with my friends. This culminates what has been a good year for me, and for wine writing on the Internet as well. I've had the pleasure of writing regularly for three great websites: Palate Press, Wine Review Online and Wine-Searcher, as well as this blog, The Gray Report. I want to thank each of them (and me?) for giving me the opportunity. I also wrote for quite a few print publications, but this is the first year as a freelancer I've ever made as much money writing online as in print. As a freelance writer, I am at the bottom of the trickle-down economy. Things were tough five years ago, as print publications cut back on their food sections and freelancer budgets. This award notwithstanding, I don't think it's because of any special qualities of mine that I'm getting more, better paying work lately. It's a reflection of the improving health of the information industry. Once again, many online sites are paying decently for content. For a few years, there was an assumption on the part of online publishers that free content was good enough. You get what you pay for in most industries, and it's surprising that many publishers still want to believe that isn't true about writing. As baseball fans say, flags fly forever. I'm glad to have this award for Best Online Wine Columnist because the category will only get more competitive. There has been a shift in the location of quality wine writing over the last 10 years. Today, much more of it is found online than in print. I believe this is the golden era for wine, as more regions in more countries than ever before are producing delicious wines. The largest factor in this is the exchange of information. A generation ago, vintners had basically two sources of information: their parents, and their country's research university. Today, vintners everywhere in the world have access not only to every country's research university, but also to thousands of other vintners' parents. It's why one of the most interesting trends in wine is not the advance of the "international style" of ripe, featureless wines, but instead the advance of winemakers trying to get away from that style by using techniques from wineries they admire on the other side of the planet. Iconoclastic wines also benefit from the exchange of information. Similarly, this is also the golden era of wine writing, because we all also have access to so much information. Online wine writing has made the banalities of former print conventions obvious. Let me take you back just 15 years, before there were wine blogs, when newspapers were still thriving. Most large newspapers and all food magazines had a wine column, and most of those were utter crap. Even some people who wrote them would admit it. A newspaper wine columnist once complained to me that he had to write about Port every Christmas, and he had to waste more than half of that 700-word annual article explaining how Port was made. Every time. It's easy now to reminisce about the great writers of the print era, and even now there is still great writing about wine in print. But in fact, the great majority of wine writing in print was like that Port column: predictable, dull, obsessively season- and event-oriented, and ruled by the notion that each column must be written as if the reader knew nothing whatsoever about the topic. Food magazines would run a wine-and-chocolate pairing column every February, for Valentine's Day. In the beginning of summer, people would be told it's time now -- and only now -- to drink rosé. Late December was the only time one could read about sparkling wine. You could cut-and-paste in last year's article. For all the column inches devoted to wine, most of it was interchangeable. The first wine bloggers brought something new: passion. They had no editor demanding the "wine with Thanksgiving" or "10 red wine blends under $10" story. They were free to explore their interests: be they orange wines or Italian endemic white varieties. Freed from space restrictions, they could write in depth about issues or personalities or regions. The absence of professional editing meant, and still means, that sometimes these posts are a little harder to read. But the information is cutting-edge. These days, print follows the online pathfinders. I believe that the concurrent expansion of interesting wine writing online and interesting wines on wine lists is not coincidental. No longer is Ribolla Gialla something freaky and unknown that the sommelier has to champion. Instead, it's something the consumer may have read something about somewhere. This didn't happen in the print era of "10 reliable Chardonnay brands" articles. Interesting wine writing requires interesting wines, and vice versa. As the wine world continues to get larger, more inclusive and more creative, it stands to reason that online wine writing will do the same. I'm humbled to be considered good enough to win this award in 2013. I cannot imagine how talented one will have to be to take it in 2023. A toast to you for your support. Cheers! Anyway, though I have no professional editor for this speech, it's beginning to feel a little long. So thank you again to the judges, for your generous decision; to Roederer, for sponsoring the awards; to Ramos-Pinto, for sponsoring my specific award; to Wine-Searcher, publisher Martin Brown and editors Rebecca Gibb and Diana Goodman; to Palate Press, publisher David Honig and my editor Rémy Charest; to Wine Review Online, publisher Robert Whitley and editor Michael Franz. And thanks to my wife for her unending support. And most of all, thank you to my loyal blog readers, especially those of you who have made nice comments over the last year on the blog and on my Facebook page. We all know about the Internet's trolls, but the strength of the online wine community is the same as that of any community, in its generosity and kindness. This is a great day for me. Thank you for allowing me to share my joy with you. Now if you'll excuse me, I'm going to go pour a bottle of Champagne over my head. Banzai! Your poking the bear makes me chuckle...again. Congratulations, Blake. This is great honor and it is well deserved. Your articles and columns are incredibly thoughtful and creative. You are a great role model for the rest of us. You are in inspiration, Blake. Keep the candor and commonsense coming. Congratulations! You are an inspiration, Blake. Keep the candor and commonsense coming. Congratulations! Wise words Blake! And congratulations. Just one small point - as the fellow Palate Press columnist who accepted the award on your behalf, I have to inform you that it's not a bottle of Champagne! This category was sponsored by Ramos Pintos, so you have a magnum of Port. Maybe you can explain how it's made to your readers, this Christmas? Simon: A magnum of Port? How am I going to pour that over my head? Thanks for accepting the award, I'm sure you were more gracious (not to mention better-looking) than I would have been in the moment. I had some notice to write this post. If I had actually stumbled up on stage after winning, I might have done a Sally Field. Can't wait to see what kind of Port I get. In fact, it very well might lead to a post of vintage vs. tawny. Awesome. And deserved. Well done, and congratulations! Congrats Blake on well deserved recognition in this category. I'm not sure how you're supposed to enjoy young Port in magnum format either. Better stick to the Champagne. A number of our Uruguayan buddies asked about you at the Wines of Uruguay tasting today. I'll give you their specific regards when next I see you. Wow, Blake! That's awesome! I'm so happy for you! It's great to see that your persistence, hard work, and talent is getting the recognition it deserves. I know I don't have to say it, but, keep up the good work!